Open-Source software makes all of our lives better. It allows us to do our jobs without reimplementing the wheel each time. It allows us to understand the nuts and bolts of how the software we use operates … and even change those internals if we need to! 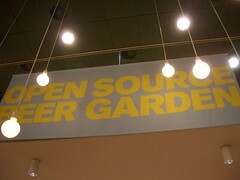 Open Source is a two-way street, however. While we aren’t legally bound to contribute back to the software we use, we like to do it out of a sense of community and because we know how much open source has helped us solve big problems. It’s also good for business, of course, since it increases Highgroove’s visibility if other developers are using software we helped create. Many of our developers contribute to open-source projects regularly. Often their involvement in a given project arose from a need such as a feature lacking in a toolset upon which they already relied. Bugs in software are a reality, but also incredibly frustrating for users of open-source libraries. If you run across a bug in a library that you are using, do the community a huge favor by tracking it down, making a bug report, and ideally, fixing it! Follow all of the same guidelines as if you were adding a new feature (see The Mechanics section below). If you just happen to have an interest in a project you’d like make better, check the bug-tracking system or issues wiki (on Github) and fix it; even if it doesn’t help you today, you never know when it will down the road. Does your favorite gem for doing something only support Ruby 1.8 and break horribly on 1.9? Do its tests fail even if library itself apparently works? Has the original author apparently moved on, or even explicitly given up support? This can lead to a tricky situation of many forks, all of which fix different, or even overlapping bugs, and each of which is vying to become the definitive new version of an old project. Attempting to coordinate that logistical problem is beyond the scope of this guide, but is definitely a pitfal to be aware of. In the event that you’d like to help revive a project and there is at least one quality fork, contribute to it. If there is not, make one yourself and invite others who have forked the project to contribute! Do you have an interest in some field that you can learn more about by developing tools? Graph-theory, artificial intelligence, mobile apps, distributed computing, Linux kernel drivers? Hot frameworks and languages like node.js and erlang? Take the time, learn the tools, and if you find them lacking … make a small contribution! You could even roll your own if you’re breaking new ground. Rails itself was extracted from the code that built the first version of Basecamp. If you find yourself writing some code in a project that feels like it has general-purpose appeal, try extracting it out into a gem. For example, the rector gem was extracted out of code that parallelized a report for a customer. The extracted library will be easier to maintain because it is separated from a specific project. It will also be a welcomed contribution that saves other developers time. Also, it might save you time if another developer contributes a feature you need back. And last but not least, it makes you and Highgroove look awesome! Building a gem is not a difficult process, so even the smallest of gems will be welcomed additions to the community. Seek out other Highgroovers who have built gems before if you want to give this a shot; you might be surprised at how easy it is. Many open-source maintainers took their first steps on a project by simply improving the documentation. Documenting some code or a common task when using software is great way to learn the internals of the a project. It sounds really mundane, but if you are using a library and realize its documentation is lacking, it would be a great service to the community if you contributed documentation back. You’ll help allay a lot of developer frustration and learn a ton along the way. To make a documentation contribution, figure out the specifics of how documentation is handled for a given project. Sometimes documentation lives within the codebase itself; other times, it lives in an associated Wiki. The Rails Guides are maintained in the lifo/docrails GitHub repository. There is an open commit policy: anyone can simply clone the repository directly and commit/push to it! This is the easiest way to contribute back to Rails. The documentation for the popular authorization library CanCan is maintained in the associated GitHub Wiki for the project. Project Wikis can be accessed by finding the project on GitHub and clicking “Wiki” toward the top right of the page. Documentation for code structures is usually maintained alongside the code itself. The Rails API docs are generated from code comments in RDoc format (for an example, see ActionMailer::Base and its generated form). Again, anyone can contribute to these docs by committing to lifo/docrails. Ryan Bates’ Railscast #300 on Contributing to Open Source covers all the details on fixing bugs and adding features to projects hosted on GitHub. It’s well worth the 9 minutes! If the project resides in another versioning and distribution system such as Sourceforge, or even as a tarball somewhere out there, you’ll have to do it the old fashioned way. There is no forking, only downloading, and if the project does use revision control but not Git you’ll have to change your workflow to match. In the case that the project uses Subversion you can use the git-svn bridge locally but keep in mind that the natural workflow of the project owners will very likely be different from the one to which you are used. Make your changes to your local code, along with tests if possible. * If you don’t have commit access to the original SCM (if there is one), which is likely during the beginnings of your interaction with a project, create a patch using diff that the author can easily analyze for merging. Be sure to introduce yourself, include a detailed (but not too detailed) explanation of your bugfix or feature, and make yourself available to answer any questions the maintainer may have for you. * If you do have access then contribute your patch per the process of the project. That may involve creating a remote branch for review or other project-specific processes. Be aware that if you utilize git locally with a bridge to a different SCM, local commits may have non-obvious effects (such as creating a new revision number in SVN) that can be prevented by rebasing before committing. This is no different than the git best-practice you already practice but the effects of missing this step here are more obvious than in the git-specific case. Make yourself available, exactly as before. As with any project the key is to make your contributions something well tested, within scope, and easily understandable by the recipient. Moreover by being communicative and available you will find your contributions much more likely to be accepted by the project one which you worked, then it’s time for an Open-Source adult beverage!